Notice the error “IsLocalOABFileCurrent:ManifestEnforcementDisabledAndLocalFileTooOld”. The file location is correct and shows where the current OAB files are. I verified the file location manually but also noticed the date discrepancy (the blue rectangles in the above image) which shows the date the attempted download was made (upper left) and the date of the files (lower right). Because the files were not changed recently the error message was downloaded and the client could not download the files. To summarize – we have an OAB that is not updating and clients that cannot update their local copies because the copies are too old. Now the problem is becoming visible to all users and will eventually become a support issue for the client. In the case of my client, the files never changed. Even tried restarting the Exchange Mailbox Assistant service without any luck. Next we renamed the folder containing the OAB files (the folder with a name that looks like a GUID). Once renamed, we tried to update the address book and restart the Mailbox Assistant service. No new files were generated. 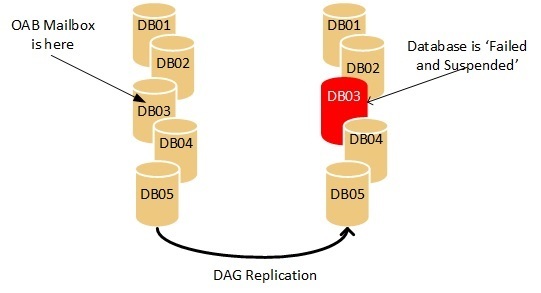 After some more troubleshooting in the event logs and diagnostic logging, I noticed that the database copy for Database02, where to OAB mailbox resided, had one copy that was in a ‘Failed and Suspended’ state. We tried to fix this copy and were unable to do so with a reseed or a resume. So we decided to remove the copy and then create a new database copy. After we removed, we tested the OAB to see if this would make a difference. OK. So we now have a fix. With a single, good database copy, we can now generate, update and download the Offline Address Book. Ironic in that if the OAB generating mailbox resides in a database that has a failed copy, then it could potentially lead to failed downloads. 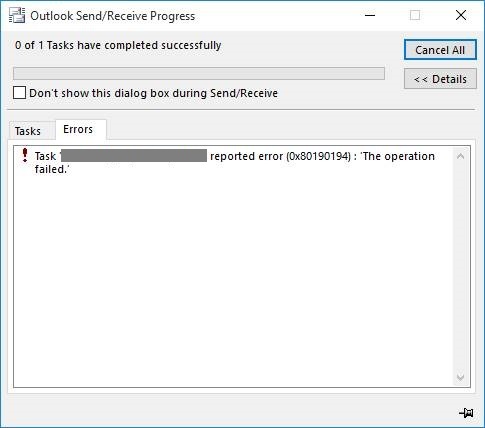 After running into this issue, I fired up my Exchange 2016 RTM lab and I was able to reproduce the issue with a good copy and a failed and suspended copy of the database where the OAB generating mailbox is located. So this is not limited to Exchange 2013, but the architecture upon which it is based. I will be updating this article to see if I can find a version where this did not occur. I am thinking either pre-CU7 or Pre-CU5 would be the place to find it. Hey Guy, thanks for the tutorial. This is literally the only one I found with this specific issue, making me rethink if I want to troubleshoot exchange as a career choice now lol.